Garrett Smithley’s racing career started in 2007, in Bandolero cars at the Atlanta Motor Speedway. Following Rookie of the Year honors and several championship series wins, he advanced to the highly competitive U.S. Legends car series, where he excelled at tracks throughout the Southeast, garnering many wins and additional championships. Through Garrett’s strong racing performances and personable demeanor, he was invited to compete in the Richard Petty Driver Search, a national driver development program. The Petty instructors were so impressed with Smithley, he was invited to join the organization as a driving instructor in 2011. Daytona 500 Champion Derrike Cope recognized Garrett’s talents during testing at Daytona with the Kesolowski family and gave him the opportunity to make his stock car debut. He completed four races in the ARCA Racing Series Presented by Menards in 2013 and 2014, including a partnership with Goodwill Industries of the Southern Rivers for his first start at the Talladega Super Speedway. 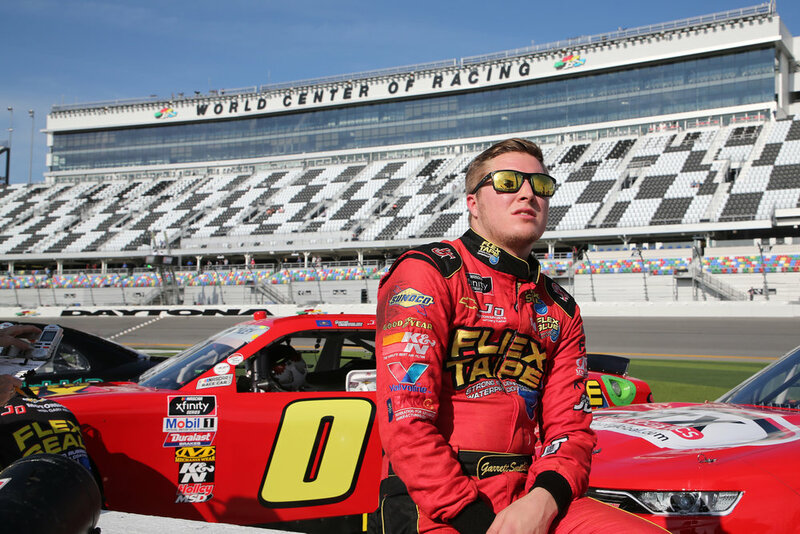 Garrett was back in an ARCA car for the first race of the 2015 season at Daytona International Speedway. Garrett reached yet another milestone in 2015 with his first start in the Camping World Truck Series at his home track, the Atlanta Motor Speedway, where he finished a solid 18th, with not a scratch on the Mittler Brothers Racing Chevy Silverado. This led to further truck races at Pocono and Michigan, again, with strong results. Smithley made his Xfinity debut at Homestead, as well. He drove the No. 70 Chevrolet Camaro for former Daytona 500 champion Derrike Cope. Smithley was in the driver’s seat of the No. 0 Chevrolet Camaro for JD Motorsports in 32 of the 33 races of the 2016 season. Smithley returned to JDM full-time in 2017 and had two top-10 finishes. In 2018, he earned a career best finish of 5th place at Daytona in February. He earned one top-five and two top-10 finishes in the season, and capped the year off with a 19th place points finish. Smithley has extensive experience in theater, singing and musical theater, which set a great foundation for him to excel in public speaking and marketing. He is excellent with social media, press interviews and public appearances, promoting both his personal brand and those of his many sponsors. With a positive attitude and infectious smile, Smithley is an easily approachable fan favorite. At 25-years-old, he is back in the JD Motorsports “Number Nuthin’” Chevy for the 2019 season.